AN exhibition designed to highlight the peaceful message of the Quran is on show just today at the Griffin Centre in Civic. The purpose of the exhibition, organised by the Ahmadiyya Muslim Association of Australia’s Canberra branch, is to highlight what the organisation stresses is the peaceful message of the Quran and to showcase what the scripture says about questions that have always fascinated humanity, like creation of the Universe, life after death, end of the Universe and prophecies about future events and inventions. Fellow citizens who don’t have a sufficient understanding of the basic teachings of Quran often give into the misperceptions that have become common place in the national media. There will be the opportunity to have questions about Islam answered in a welcoming environment, the organisation says. 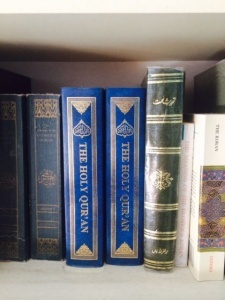 The Ahmadiyya Muslim Association has translated the Quran to more than 70 languages and some of those translations will be on display at the exhibition.